Make a plankton net. Tow the net by a dock, wade with it, hold it in a current, or tow it from a rowboat*. Do this for about 20 minutes. Save the sample. Examine it under a microscope or high-power glass. Identify the three most common types of plankton in the sample. Make a series of models (clay or plaster and wood) of a volcanic island. Show the growth of an atoll from a fringing reef through a barrier reef. Describe the Darwinian theory of coral reef formation. Measure the water temperature at the surface, midwater, and bottom of a body of water four times daily for five consecutive days. You may measure depth with a rock tied to a line. Make a Secchi disk to measure turbidity (how much suspended sedimentation is in the water). Measure the air temperature. Note the cloud cover and roughness of the water. Show your findings (air and water temperature, turbidity) on a graph. Tell how the water temperature changes with air temperature. Make a model showing the inshore sediment movement by littoral currents, tidal movement, and wave action. Include such formations as high and low waterlines, low tide terrace, berm, and coastal cliffs. Show how the offshore bars are built up and torn down. Make a wave generator. Show reflection and refraction of waves. Show how groins, jetties, and breakwaters affect these patterns. Track and monitor satellite images available on the Internet for a specific location for three weeks. Describe what you have learned to your counselor. 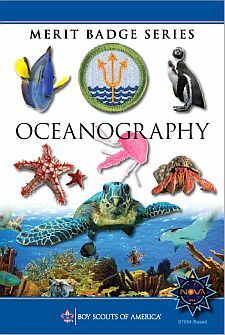 Write a 500-word report on a book about oceanography approved by your counselor. Visit one of the following: (1) an oceanographic research ship, or (2) an oceanographic institute, marine laboratory, or marine aquarium. Write a 500-word report about your visit.